To relate to this novel you need to understand the reason for the book, memories. Those snapshots of time stored in our own personal biological computer situated in our noggin. In many ways it's these recordings of our travels through time (and if we are very lucky, space) that make us the people we are; which is why the illness Alzheimer's is such a cruel beast. It robs us of those precious memories, it robs us of our loved ones, it robs us of our past and it makes us become someone who at times isn't really us anymore. I experienced this as a young teenager when my Gran became stricken - I remember it being a confusing, scary time - after all how does a child understand that someone you've known your whole life will sometimes simply not remember who you are or even who they are? I cannot begin to understand how scary and distressing it must be for the sufferer. For Steve Berry it was his mother being diagnosed with the illness that made him want to do something, want to help the research for a cure and what better way than to collect memories and store them all in one book. As a life long fan, the memories he has chosen to collect are those of the longest running science fiction show in history - Doctor Who. A true devotee of the show, he spent five years collecting information to put "Behind the Sofa" together. 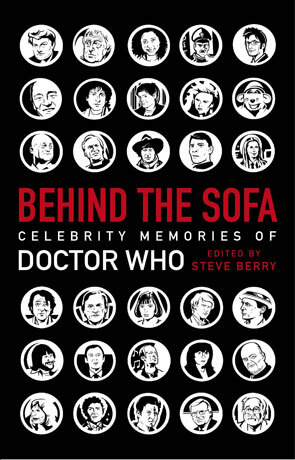 With a huge cast of contributors from celebrities to writers to actors and people who have worked on the show, all share their earliest and fondest recollections of the 1200 year old Time Lord, his adventures through time and space along with who "their doctor" is (mine is Tom Baker by the way). All royalties from the sale of this book are going to Alzheimer's Research UK, which in itself is reason enough to go out and buy it. If you need another then you need look no further than the book itself. Over 150 entries from a massively diverse range of people means that no two entries are alike and reading through them is a real joy. It's also introduced by the star-metal sword-wielding knight of the realm, Sir Terry Pratchett; himself a sufferer of early onset Alzheimers. This is a warm-hearted collection put together by a true fan of the series, collecting memories and anecdotes from other true fans. Even if you have only a passing interest in Doctor Who you will find this book enthralling and for any true "Whovian" this book is a must. Still not convinced? SFBook is lucky enough to host an excerpt from the book by that gloriously funny man Paul Whitehouse, enjoy. Written on 22nd November 2013 by Ant.